Providing you the best range of erma japan hand refractometer and fructose digital refractometer with effective & timely delivery. 0 - 28% AND 0 - 100%. 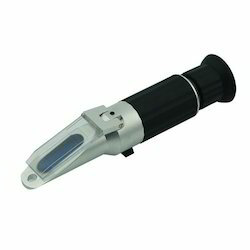 Hand refractometer model D, for urine, serum / protein, erma japan make model : D , Refractometer for battery / coolants, ERMA japan. Ideal for the analysis of fruits, energy drinks, puddings, soy milk juices, jam, marmalade, honey, soups, jelly, tofu and condiments.The dual-level LCD displays measurement and temperature readings simultaneously, Automatic Temperature Compensation for accurate measurements , Easy measurement; place a few drops of the sample in the well and press the READ key, BEPS (Battery Error Prevention System) alerts the user in the event that low battery power could adversely affect readings. IP65 water protection; built to perform under harsh laboratory and field conditions.Quick, accurate results, readings are displayed in approximately 1.5 seconds.Single point calibration with distilled or deionized water, Small sample size, can be as small as 2 metric drops.Automatic shut-off after three minutes of non-use Stainless steel sample well, easy to clean and corrosion resistant , ABS thermoplastic casing . Measurement Time : approximately 1.5 seconds. 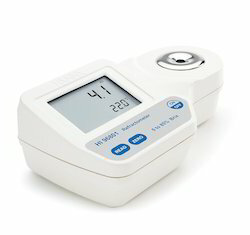 Looking for Refractometers- Erma Japan ?